The conflict between African Americans and the United Federation of Teachers and its many Jewish teachers during the Ocean Hill-Brownsville strikes came as a complete surprise. Jews had been a prominent part of the Civil Rights Movement, and they couldn’t quite grasp this new reality. It was of course true that the UFT was predominantly Jewish, but that was because most teachers in New York were Jews, and they’d had nothing to do with marginalizing Black teachers. As a matter of fact, they and the entire labor movement were in favor of integrating the teaching staff of the city. At the Lorraine Motel, right after the assissination of Dr. King. 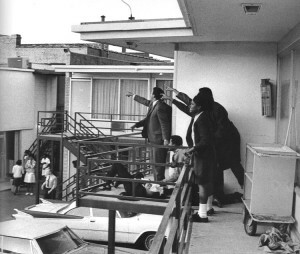 A few months earlier, Martin Luther King, Jr. had been murdered in Memphis, Tennessee (April 4th, 1968). What most people have forgotten about this tragedy is that it occurred as a result of a strike by unionized sanitation workers, and that King had gone to Memphis to support the workers in their protracted strike. I don’t remember who won and who lost that strike, but Martin Luther King, Jr. lost his life in that struggle. Immediately the rest of the labor movement decided to show its support, among them the UFT. It asked for volunteers to fly to Memphis to show labor solidarity with the striking workers, most of whom were African-American, and outrage at the murder of Dr. King, and I was one of the New York teachers, who showed up in Memphis to take part in a memorial demonstration. Shanker was there, as were many of the other leaders of the labor movement, as well as many of the civil rights leaders. It was all very impressive, and somehow I found myself in the front line of the marching column, mixed in among all the leadership. It was an event not to be forgotten, and made the events of September to November, 1968, even more incomprehensible. By then I was a member of the UFT Delegate Assembly, and involved in UFT politics. The most recent struggles within the UFT had been the question of support for the Vietnam War, which Al Shanker supported and many members did not, and the question of the UFT president’s salary. Shanker got his way on Vietnam without too much trouble but with some clever parliamentary maneuvering; he also got his way on his salary in the same way. The UFT Constitution specified that the president’s salary was to be no higher than that of the highest paid teacher. This was thought to be an encouragement for the president to strive for higher salaries for teachers. However, by this time the UFT had grown to be an organization of over 60,000 people, and in retrospect, keeping the head of an organization of that size and power at the salary of the highest paid teacher was somewhat ludicrous. Ludicrous or not, I was among those who favored things as they were. We pointed out to Shanker at a meeting of the Delegate Assembly that since the salary issue was embedded in our Constitution, he would need a 2/3 majority to amend it. Shanker, presiding over the meeting, asked for a vote on a motion not to require a 2/3 majority on this matter. In this body of several hundred people, that motion passed by one vote. He then handed the meeting over to his vice-president, who had someone make the necessary motion to give Shanker his raise, and the outcome was a foregone conclusion. I also got a little lesson about parliamentary maneuvering. It was also interesting while it was happening! And thank you for being such a faithful reader. The aim is not to bore!